What is gout? 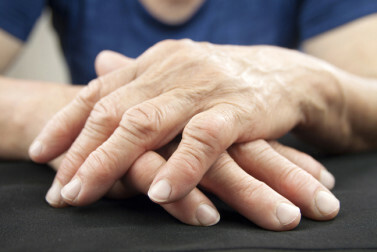 Gout is a type of arthritis that causes severe pain, redness, stiffness, and swelling of the joints. 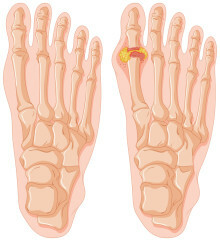 Often, the big toe is affected. 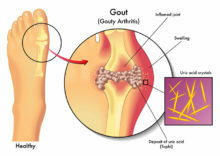 People develop gout when they have a buildup of uric acid in their joints. Uric acid is a byproduct produced when the body breaks down substances called purines, which are found in foods like liver, mackerel, beans, peas, and beer. When too much uric acid builds up in the blood, it can congregate in the joints and form sharp crystals. You?re more likely to get gout if you eat a diet high in purine-containing foods. People who are overweight or obese are also more prone to this condition, because their body naturally produces more uric acid, and their kidneys have to work harder to remove it. Diseases that accompany obesity, such as diabetes and high blood pressure, contribute to gout risk. Certain medicines, including diuretics and cyclosporine, also make you more likely to develop gout. To determine whether you have gout or another type of arthritis, your doctor may take a sample of fluid from your joint and examine it to look for uric acid crystals. Gout is typically treated with medicines that bring down inflammation and reduce pain, such as NSAIDs (ibuprofen, naproxen, and others), steroids, and colchicine. 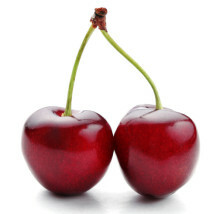 You may also get medicine to block uric acid production, or help the kidneys remove it more efficiently. Lowering your intake of foods high in purines, and exercising to keep your weight in check are two ways to prevent?and relieve?gout.